The Lucky Clover quilt block is a simple block to make and is a wonderful choice for those who might be examining their Irish roots. 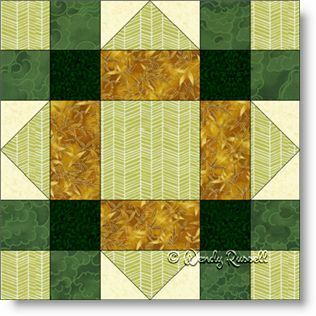 Squares, rectangles and a few flying geese patches are all that goes into creating this block. What will make it truly special is how you lay out your colours. I chose the obvious greens, but don't let the name of this block hold you back from letting your creativity go wild. Both of the sample quilts illustrated set the quilt blocks on point. The quilt on the left uses additional half blocks and sashing, which (to me) gives a look of "plaid". The quilt on the right uses less quilt blocks, but adds additional interest by changing up colours of the extra large triangles and also adding sashing between the blocks.